NET identifies areas in the neighborhood that could use enhancement. 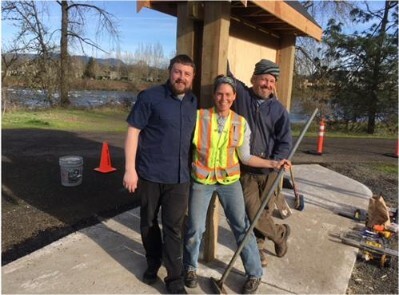 To encourage positive social use, we were awarded a city HRNI matching grant to install seating, an information kiosk, trash receptacle, and portable stage on the West Bank path at Hilliard. The Homeless Advocacy Committee is our neighborhood liaison to efforts addressing the needs of the unhoused. We want creative solutions that benefit the whole community. In the River and Garden district, the Green and Resilient Neighborhood Committee educates and organizes collaborative neighborhood efforts that reduce our eco-footprints and prepare for natural disasters. Learn about producing food, water, and energy close to home. Sharing knowledge and labor is a good way to get to know each other. What does a 9.0 earthquake look like? Community Emergency Response Team has regular free training for residents.